HRWC worked to draft, pass, and implement the City of Ann Arbor’s Greenbelt program along with supporting other natural area and farmland preservation programs in the watershed. Having served as a commissioner since the beginning of the program, I have seen the program grow in scale, scope, and matching dollars. It is tremendous to see the high quality natural areas and farmland, local farms, and riparian areas permanently protected and contributing to better water quality in the Huron River Watershed. 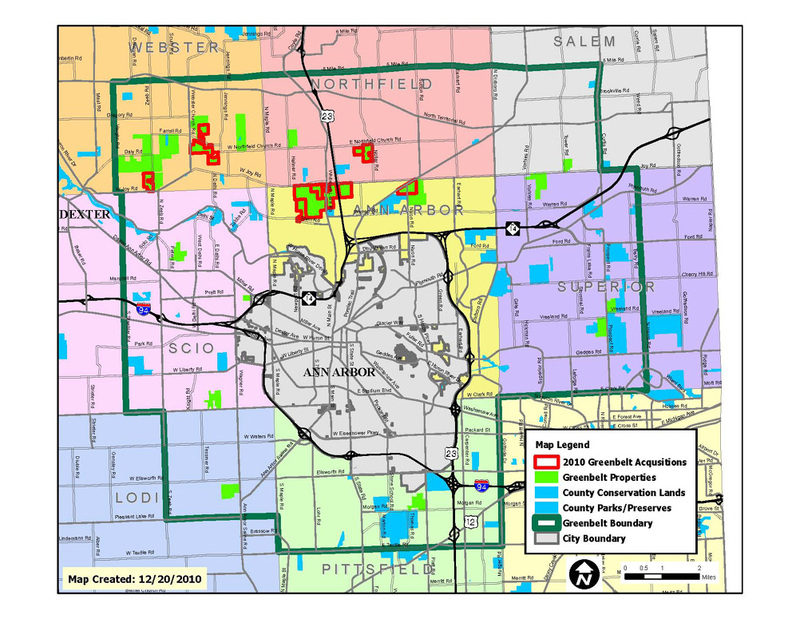 2010 was the busiest year yet for the City of Ann Arbor’s Greenbelt Commission’s efforts in land preservation. Just this past month, the city completed 3 easements (Honke, Whitney and Clark) and partnered with Ann Arbor Township on 2 more properties (Pardon and Thomas Braun). With the completion of these deals, the Greenbelt has protected a total of 2,802 acres. This year alone, the Greenbelt, along with Washtenaw County partners, have protected 1,017 acres of farmland on 9 properties within the Greenbelt District. These deals have included over $3.34 million from the Federal Farm and Ranchland Protection Program, $2.42 million from our Washtenaw County partners, and over $90,000 in landowner donations. On average, the City of Ann Arbor paid 43% of the Fair Market Value for deals completed this year – or secured 57% matching funds on average. In addition, the Greenbelt has protected 1,182 acres in Webster Township and 826 acres in Ann Arbor Township – almost two 1,000-acre blocks completed. Below is a map which shows the deals completed to date, highlighting those completed this year. See a bigger version of the picture below by clicking on it or downloading it as a pdf.